It's been awhile since I last posted here, not because I haven't wanted to, but because life is, well, life and sometimes blogging gets set aside when there are many other things to juggle. I'm sure you understand, right? But, when I do get to write here in my corner of blog land, it's always fun and a blessing and I hope anyone following my blog enjoys my blog posts as well! Last weekend on Saturday, April 23, it was the feast day of Saint George. Our family had a very busy soccer tournament weekend out of town over the weekend so our family celebrated St. George's feast day this past week on Monday night. 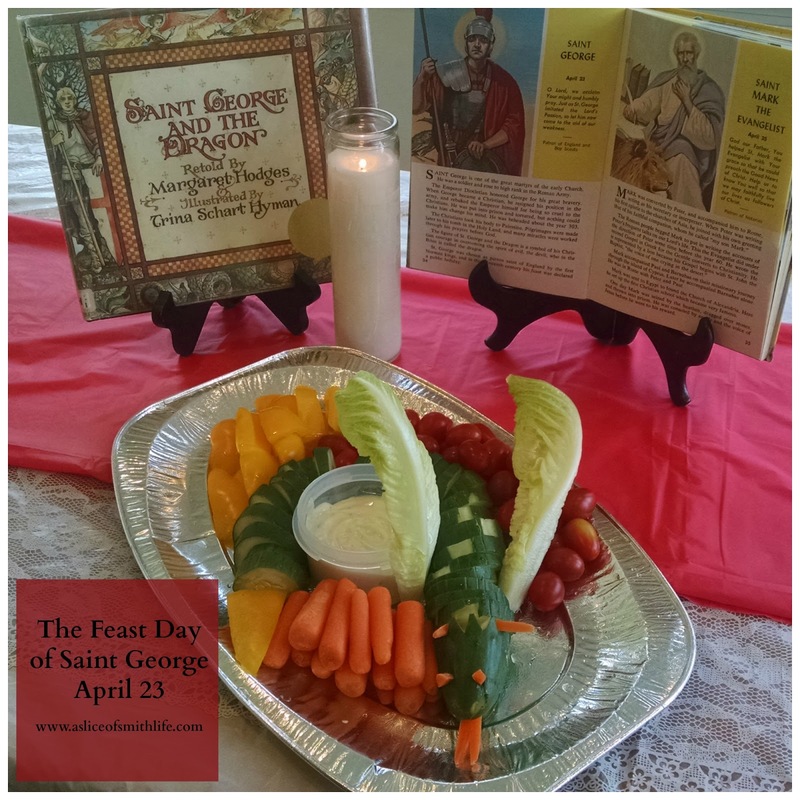 This is the second year we have celebrated Saint George's feast day with the reading of Saint George and the Dragon and we also read about Saint George in Picture Book of Saints. Saint George was put into prison and tortured for being a Christian, but he never denounced his faith in Christ. He was beheaded about the year 303. With a cucumber, carrots, yellow peppers, cherry tomatoes and 2 lettuce leaves a veggie dragon can be created. 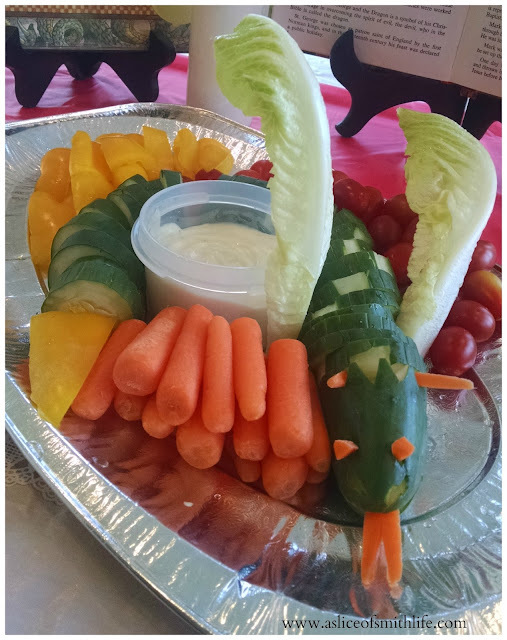 I first saw the creative, easy and nutritious veggie dragon idea from Jessica at Shower of Roses. And why is St. George associated with fighting dragons? Find out more about St. George and the dragon with this Catholic Online link. It's always an extra blessing when my husband's work schedule allows him to celebrate liturgical feast days with us. 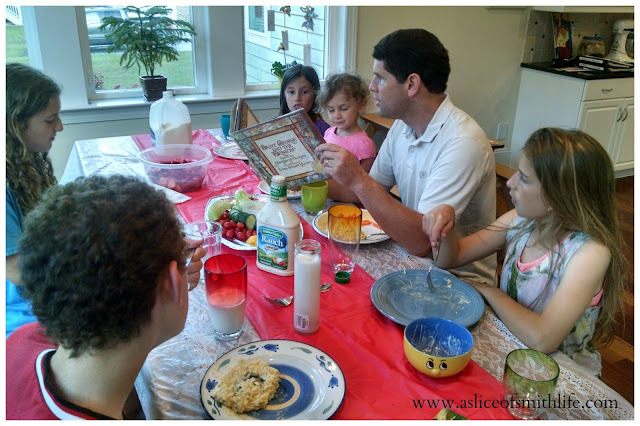 Since we celebrated Saint George in the evening at dinner time, he was home and read the book to our family. It was great to discuss how St. George is a great role model to follow because he never gave up his Christian faith even when it was the cause of his persecution and ultimate violent death. I placed a plastic lace tablecloth down with a red plastic tablecloth as a table runner to represent that Saint George was a martyr and shed his blood rather than deny truth and faith in Christ. 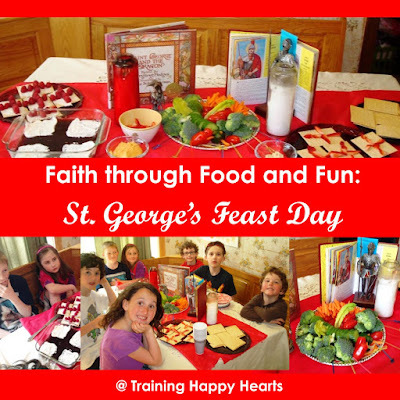 Martianne over at Training Happy Hearts had a beautiful feast day celebration for Saint George this year filled with delicious symbolic food and she even gives great ideas to incorporate different subject areas to go with the Saint George theme. Her table is set so beautifully and I love how she has the little plastic swords around the dragon fighting the evil dragon. It seems her children and friends liked fighting with the little swords too! :) Love it! Be sure to check out her post with more details! We love the feast of St. George, especially since my young man is in the Troops of St. George. Great celebration you had with your family, Tracy! What a wonderful way to celebrate the day!! I do love reading that story, though I admit to missing many St G feast days over the years! Your dragon is gorgeous! Wow, I'm happy you took pictures before the kids dug in! You should definitely share that at food sites. It's perfect, too, for a middle ages theme party you know? Love it Tra! Oh that's wonderful your son is in a St. George troop! I've heard such good things about it, but there is not one in our local area (yet). Thanks for stopping in! Thanks Chris for your visit and comments!